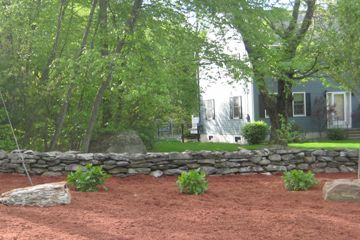 Bark Mulch can be delivered and installed in small or large quantities. If you don�t know how many cubic yards you for your property don�t worry, we will come out and measure the areas for you. Mulch is generally installed 1-2 times a year in spring and summer to give your landscape beds that fresh catered look. All beds are edged with a sharp and crisp edge at the same time mulch is installed. 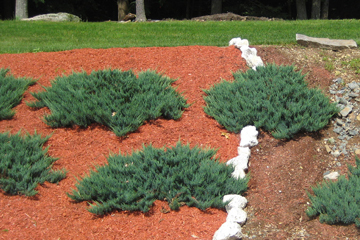 Maintaining your landscape beds is essential to the health and appearance of your landscape. Bed maintenance includes maintaining the bed�s sharp edges, removing any weeds and unwanted plant growth or failing plants. It also includes pruning and trimming shrubs, plants and trees as necessary for both the health and appearance of your plants. Measure the Length(L) and Width(W) in feet of the areas to be covered with mulch. Multiply these numbers. This will give you the Area(A) to be covered. Since mulch is measured in cubic yards you must calculate the volume. Multiply the Area by the desired Depth(D) you want the mulch to be. For 1 inch use .083, for 2 inches use .17, for 3 inches use .25. You now have the cubic feet. Divide the cubic feet by 27 (the number of cubic feet in one yard) and you now know how much mulch you will need!